I've been a huge fan of Etude House and love their products (see previously featured items here). I was recently picked as an Etude House ambassador. I'm absolutely honored to be the Princess Nail Art Ambassador. I often DIY my nail art (some past designs here) and love to try out different designs for the seasons. The top image shows the nail polishes from Etude House. The collections included here are Princess Etoinette, Dear My Deep Color Nails, Dear My Party Nails and Sweet Recipe. I'm totally looking forward to design some nail art! I already have a few designs in mind and I'll be sharing them on the blog soon! 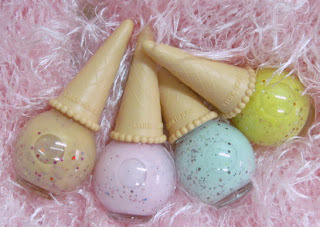 I also received the nail polishes from the Sweet Recipe collection. Just look at the colors! So sweet and perfect for spring. I love the design of the bottles- just like ice cream. Watch out for some designs and tutorials coming up really soon! Disclaimer: This is a sponsored post. All products featured are courtesy of Etude House Singapore. Regardless, I only recommend products I use personally and believe will be good for my readers. All opinions expressed are of my own. Etude House Sweet Recipe goodies! NEW: Starbucks Sakura 2013 Spring Tumblers!